It seems inconceivable that you'd ever be less than impressed by a set of KEF loudspeakers. 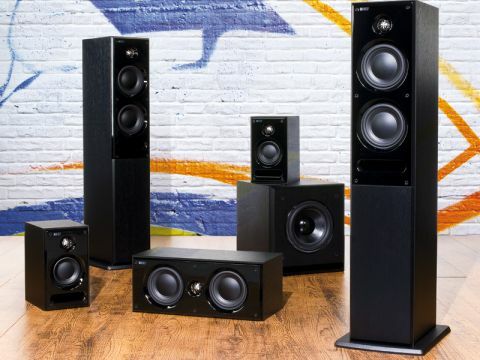 Yet these, its C Series, are KEF's least expensive, so are they any good? I grabbed my BD copy of Beowulf to find out, because the Motion-Capture system that enables a stocky geezer like Ray Winstone to become a 6ft man-god also seems to engender cool sound design. You get raucous party scenes in the mead hall, Grendel the demon talking in Middle English to his mama (voiced by Angelina Jolie) with huge reverb and spaciousness in a vast cavern, and someone getting their arm ripped off in a scrap. It's perfect for giving your speakers a workout. Tweeters are often the most costly bit in loudspeakers and it's usually here that you will first discern excellence or lack of ability. Oddly enough, the C Series high-frequency driver – the same one from the guts of the Uni-Q devices fitted to KEF's Q series – revealed both. As the movie opens, the background chatter of the crowd in the mead hall is remarkably detailed around the system, with perfect voice-matching. You get depth of soundfield and a sweet vocal from the queen warbling away with her harp. However, ultimate impact and HF level is a little limited, as I found out later. The subwoofer is a super long-throw 8in design with primitive controls, but it blends perfectly. However, the dynamics of the soundtrack are wider than the small low-power woofer liked, with the explosive entry of Grendel sadly compressed. But for the money, the C4 subwoofer is vastly more musical than most – it didn't boom, or go one-note, proving that although ported, it's not a stretch-it design. When Ray Winstone fights the monster, I ran the C Series system at a reference level zero dB, and could easily hear the burning torches crackling in the background. Dynamics are good, too: the scene where a horrible booming roar in a cavern echoes around Grendel's deformed skull needs headroom to play best and the KEFs did admirably, as they were already playing hard. They stay nice and linear at low volumes too – a sign of quality – but when driven with vigour tend to get a bit harsh around the high-end. I am being overly critical, though: it still sounds great for an entry-level array. In many ways, the buyers of these 'budget' babies benefit most from KEF R&D's years of cunning. That technology goes into the best models, but years later KEF uses all sorts of its heritage to put out affordable kit like the C Series. There is proof of savings, though, like the square-edged boxes and the less than over-engineered speaker terminals. Still gold-plated, but not chunky and, of course, they don't have the KEF signature Uni-Q point source tech. Instead, the C Series gets an aluminium dome tweeter and its 'Tangerine' protective grille, but it is conventionally mounted above the bass drivers. In terms of design, they aren't exactly up to Philippe Starcke levels. The port on the C1 subwoofer, for is not a moulded tube but a cheaper classic wooden slot design. And while there's still a nice set of spikes and a separate panel for the base plate of each C5 or C7, it's all made to a price. At the end of the day, these bigdomed bass drivers with the single cone-stiffening rib are KEF ones, so there is a certain 'given' about the quality. They are fast, tight and very able for their size. Versus an awful lot of what else is out there, you'd have to audition a truckload of £900 speaker systems to find one that would whup the KEF C Series!